Ambassador Morgenthau's Story. 1918. Chapter Fifteen. "I shall not return to Constantinople until I have conquered Egypt!" The whole performance seemed to me to be somewhat bombastic. Inevitably it called to mind the third member of another bloody triumvirate who, nearly two thousand years before, had left his native land to become the supreme dictator of the East. And Djemal had many characteristics in common with Mark Antony. Like his Roman predecessor, his private life was profligate; like Antony, he was an insatiate gambler, spending much of his leisure over the card table at the Cercle d'Orient. Another trait which he had in common with the great Roman orator was his enormous vanity. The Turkish world seemed to be disintegrating in Djemal's time, just as the Roman Republic was dissolving in the days of Antony; Djemal believed that he might himself become the heir of one or more of its provinces and possibly establish a dynasty. He expected that the military expedition on which he was now starting would make him not only the conqueror of Turkey's fairest province, but also one of the powerful figures of the world. Afterward, in Syria, he ruled as independently as a medieval robber baron---whom in other details he resembled; he became a kind of sub-sultan, holding his own court, having his own selamlik, issuing his own orders, dispensing freely his own kind of justice, and often disregarding the authorities at Constantinople. The applause with which Djemal's associates were speeding his departure was not entirely disinterested. The fact was that most of them were exceedingly glad to see him go. He had been a thorn in the side of Talaat and Enver for some time, and they were perfectly content that he should exercise his imperious and stubborn nature against the Syrians, Armenians, and other non-Moslem elements in the Mediterranean provinces. Djemal was not a popular man in Constantinople. The other members of the triumvirate, in addition to their less desirable qualities, had certain attractive traits---Talaat, his rough virility and spontaneous good nature, Enver, his courage and personal graciousness---but there was little about Djemal that was pleasing. An American physician who had specialized in the study of physiognomy had found Djemal a fascinating subject. He told me that he had never seen a face that so combined ferocity with great power and penetration. Enver, as his history showed, could be cruel and bloodthirsty, but he hid his more insidious qualities under a face that was bland, unruffled, and even agreeable. Djemal, however, did not disguise his tendencies, for his face clearly pictured the inner soul. His eyes were black and piercing; their sharpness, the rapidity and keenness with which they darted from one object to another, taking in apparently everything with a few lightning-like glances, signalized cunning, remorselessness, and selfishness to an extreme degree. Even his laugh, which disclosed all his white teeth, was unpleasant and animal-like. His black hair and black beard, contrasting with his pale face, only heightened this impression. At first Djemal's figure seemed somewhat insignificant---he was undersized, almost stumpy, and somewhat stoop-shouldered; as soon as he began to move, however, it was evident that his body was full of energy. Whenever he shook your hand, gripping you with a vise-like grasp and looking at you with those roving, penetrating eyes, the man's personal force became impressive. Yet, after a momentary meeting, I was not surprised to hear that Djemal was a man with whom assassination and judicial murder were all part of the day's work. Like all the Young Turks his origin had been extremely humble. He had joined the Committee of Union and Progress in the early days, and his personal power, as well as his relentlessness, had rapidly made him one of the leaders. After the murder of Nazim, Djemal had become Military Governor of Constantinople, his chief duty in this post being to remove from the scene the opponents of the ruling powers. This congenial task he performed with great skill, and the reign of terror that resulted was largely Djemal's handiwork. Subsequently Djemal became a member of the Cabinet, but he could not work harmoniously with his associates; he was always a troublesome partner. In the days preceding the break with the Entente he was popularly regarded as a Francophile. Whatever feeling Djemal may have entertained toward the Entente, he made little attempt to conceal his detestation. of the Germans. It is said that he would swear at them in their presence---in Turkish, of course; and he was one of the few important Turkish officials who never came under their influence. The fact was that Djemal represented that tendency which was rapidly gaining the ascendancy in Turkish policy---Pan-Turkism. He despised the subject peoples of the Ottoman country--- Arabs, Greeks, Armenians, Circassians, Jews; it was his determination to Turkify the whole empire. His personal ambition brought him into frequent conflict with Enver and Talaat, who told me many times that they could not control him. It was for this reason that, as I have said, they were glad to see him go---not that they really expected him to capture the Suez Canal and drive the English out of Egypt. Incidentally, this appointment fairly indicated the incongruous organization that then existed in Turkey. As Minister of Marine, Djemal's real place was at the Navy Department; instead of working in his official field the head of the navy was sent to lead an army over the burning sands of Syria and Sinai. Yet Djemal's expedition represented Turkey's most spectacular attempt to assert its military power against the Allies. As Djemal moved out of the station, the whole Turkish populace felt that an historic moment had arrived Turkey in less than a century had lost the greater part of her dominions, and nothing had more pained the national pride than the English occupation of Egypt. All during this occupation, Turkish suzerainty had been recognized; as soon as Turkey declared war on Great Britain, however, the British had ended this fiction and had formally taken over this great province. Djemal's expedition was Turkey's reply to this act of England. The real purpose of the war, the Turkish people had been told, was to restore the vanishing empire of the Osmans, and to this great undertaking the recovery of Egypt was merely the first step. The Turks also knew that, under English administration, Egypt had become a prosperous country and that it would, therefore, yield great treasure to the conqueror. It is no wonder that the huzzahs of the Turkish people followed the departing Djemal. About the same time Enver left to take command of Turkey's other great military enterprise---the attack on Russia through the Caucasus. Here also were Turkish provinces to be "redeemed." After the war of 1878, Turkey had been compelled to cede to Russia certain rich territories between the Caspian and the Black seas, inhabited chiefly by Armenians, and it was this country which Enver now proposed to reconquer. But Enver had no ovation on his leaving. He went away quietly and unobserved. With the departure of these two men the war was now fairly on. Despite these martial enterprises, other than warlike preparations were now under way in Constantinople. At that time---in the latter part of 1914---its external characteristics suggested nothing but war, yet now it suddenly became the great headquarters of peace. The English fleet was constantly threatening the Dardanelles and every day Turkish troops were passing through the streets. Yet these activities did not chiefly engage the attention of the German Embassy. Wangenheim was thinking of one thing and of one thing only; this fire-eating German had suddenly become a man of peace. For he now learned that the greatest service which a German ambassador could render his emperor would be to end the war on terms that would save Germany from exhaustion and even from ruin; to obtain a settlement that would reinstate his fatherland in the society of nations. In November, Wangenheim began discussing this subject. It was part of Germany's system, he told me, not only to be completely prepared for war but also for peace. "A wise general, when he begins his campaign, always has at hand his plans for a retreat, in case he is defeated," said the German Ambassador. "This principle applies just the same to a nation beginning war. There is only one certainty about war---and that is that it must end some time. So, when we plan war, we must consider also a campaign for peace." But Wangenheim was interested then in something more tangible than this philosophic principle. Germany had immediate reasons for desiring the end of hostilities, and Wangenheim discussed them frankly and cynically. He said that Germany had prepared for only a short war, because she had expected to crush France and Russia in two brief campaigns, lasting not longer than six months. Clearly this plan had failed and there was little likelihood that Germany would win the war; Wangenheim told me this in so many words. Germany, he added, would make a great mistake if she 'persisted in fighting to the point of exhaustion, for such a fight would mean the permanent loss of her colonies, her mercantile marine, and her whole-economic and commercial status. "If we don't get Paris in thirty days, we are beaten," Wangenheim had told me in August, and though his attitude changed somewhat after the battle of the Marne, he made no attempt to conceal the fact that the great rush campaign had collapsed, that all the Germans could now look forward to was a tedious, exhausting war, and that all they could obtain from the existing situation would be a drawn battle. "We have made a mistake this time," Wangenheim. said, "in not laying in supplies for a protracted struggle; it was an error, however, that we shall not repeat; next time we shall store up enough copper and cotton to last for five years." Wangenheim had another reason for wishing an immediate peace, and it was a reason which shed much light upon the shamelessness of German diplomacy. The preparation which Turkey was making for the conquest of Egypt caused this German ambassador much annoyance and anxiety. The interest and energy which the Turks had manifested in this enterprise were particularly giving him concern. Naturally I thought at first that Wangenheim. was worried that Turkey would lose; yet he confided to me that his real fear was that his ally might succeed. A victorious Turkish campaign in Egypt, Wangenheim explained, might seriously interfere with Germany's plans. Should Turkey conquer Egypt, naturally Turkey would insist at the peace table on retaining this great province and would expect Germany to support her in this claim. But Germany had no intention then of promoting the reestablishment of the Turkish Empire. At that time she hoped to reach an understanding with England, the basis of which was to be something in the nature of a division of interests in the East. Germany desired above all to obtain Mesopotamia as an indispensable part of her Hamburg-Bagdad scheme. In return for this, she was prepared to give her endorsement to England's annexation of Egypt. Thus it was Germany's plan at that time that she and England should divide Turkey's two fairest dominions. This was one of the proposals which Germany intended to bring forth in the peace conference which Wangenheim was now scheming for, and clearly Turkey's conquest of Egypt would have presented complications in the way of carrying out this plan. On the morality of Germany's attitude to her ally, Turkey, it is hardly necessary to comment. The whole thing was all of a piece with Germany's policy of "realism" in foreign relations. Nearly all German classes, in the latter part of 1914 and the early part of 1915, were anxiously looking for peace and they turned to Constantinople as the most promising spot where peace negotiations might most favourably be started, The Germans took it for granted that President Wilson would be the peacemaker; indeed, they never for a moment thought of any one else in this capacity. The only point that remained for consideration was the best way to approach the President. Such negotiations would most likely be conducted through one of the American ambassadors in Europe. Obviously, Germany had no means of access to the American ambassadors in the great enemy capitals, and other circumstances induced the German statesmen to turn to the American Ambassador in Turkey. At this time a German diplomat appeared in Constantinople who has figured much in recent history---Dr. Richard von Kühlmann, afterward Minister for Foreign Affairs. In the last five years Dr. Von Kühlmann has seemed to appear in that particular part of the world where important confidential diplomatic negotiations are being conducted by the German Empire. Prince Lichnowsky has described his activities in London in 1913 and 1914, and he figured even more conspicuously in the infamous peace treaty of Brest-Litovsk. Soon after the war started Dr. Von Kühlmann came to Constantinople as Conseiller of the German Embassy, succeeding Von Mutius, who had been called to the colours. For one reason his appointment was appropriate, for Kühlmann had been born in Constantinople, and had spent his early life there, his father having been president of the Anatolian railway. He therefore understood the Turks as only one can who has lived with them for many years. Personally, he proved to be an interesting addition to the diplomatic colony. He impressed me as not a particularly aggressive, but a very entertaining, man; he apparently wished to become friendly with the American Embassy and he possessed a certain attraction for us all as he had just come from the trenches and gave us many vivid pictures of life at the front. At that time we were all keenly interested in modern warfare, and Kühlmann's details of trench fighting held us spellbound many an afternoon and evening. His other favourite topic of conversation was Welt-Politik, and on all foreign matters he struck me as remarkably well informed. At that time we did not regard Von Kühlmann as an important man, yet the industry with which he attended to his business attracted everyone's attention even then. Soon, however, I began to have a feeling that he was exerting a powerful influence in a quiet, velvety kind of way. He said little, but I realized that he was listening to everything and storing all kinds of information away in his mind; he was apparently Wangenheim's closest confidant, and the man upon whom the Ambassador was depending for his contact with the German Foreign Office. About the middle of December, Von Kühlmann left for Berlin, where he stayed about two weeks. On his return, in the early part of January, 1915, there was a noticeable change in the atmosphere of the German Embassy. Up to that time Wangenheim had discussed peace negotiations more or less informally, but now he took up the matter specifically. I gathered that Kühlmann had been called to Berlin to receive all the latest details on this subject, and that he had come back with the definite instructions that Wangenheim should move at once. In all my talks with the German Ambassador on peace, Kühlmann. was always hovering in the background; at one most important conference he was present, though he participated hardly at all in the conversation, but his rôle, as usual, was that of a subordinate and quietly eager listener. Wangenheim. now informed me that January, 1915, would be an excellent time to end the war. Italy had not yet entered, though there was every reason to believe that she would do so by spring. Bulgaria and Rumania were still holding aloof, though no one expected that their waiting attitude would last forever. France and England were preparing for the first of the 6 " spring offensives, " and the Germans had no assurance that it would not succeed; indeed, they much feared that the German armies would meet disaster. The British and French warships were gathering at the Dardanelles; and the German General Staff and practically all military and naval experts in Constantinople believed that the Allied fleets could force their way through and capture the city. Most Turks by this time were sick of the war, and Germany always had in mind that Turkey might make a separate peace. Afterward I discovered that whenever the military situation looked ominous to Germany, she was always thinking about peace, but that if the situation improved she would immediately become warlike again; it was a case of sick-devil, well-devil. Yet, badly as Wangenheim wanted peace in January, 1915, it was quite apparent that he was not thinking of a permanent peace. The greatest obstacle to peace at that time was the fact that Germany showed no signs that she regretted her crimes, and there was not the slightest evidence of the sackcloth in Wangenheim's attitude now. Germany had made a bad guess, that was all; what Wangenheim and the other Germans saw in the situation was that their stock of wheat, cotton, and copper was inadequate for a protracted struggle. In my notes of my conversations with Wangenheim I find him frequently using such phrases as the "next war," "next time," and, in confidently looking forward to another greater world cataclysm than the present, he merely reflected the attitude of the dominant junker-military class. The Germans apparently wanted a reconciliation---a kind of an armistice---that would give their generals and industrial leaders time to prepare for the next conflict. At that time, nearly four years ago, Germany was moving for practically the same kind of peace negotiations which she has suggested many times since and is suggesting now, Wangenheim's plan was that representatives of the warring powers should gather around a table and settle things on the principle of "give and take." He said that there was no sense in demanding that each side state its terms in advance. "For both sides to state their terms in advance would ruin the whole thing," he said. "What would we do? Germany, of course, would make claims which the other side would regard as ridiculously extravagant. The Entente would state terms which would put all Germany in a rage. As a result, both sides would get so angry that there would be no conference. No---if we really want to end this war we must have an armistice. Once we stop fighting, we shall not go at it again. History presents no instance in a great war where an armistice has not resulted in peace. It will be so in this case." Yet, from Wangenheim's conversation I did obtain a slight inkling of Germany's terms. The matter of Egypt and Mesopotamia, set forth above, was one of them. Wangenheim. was quite insistent that Germany must have permanent naval bases in Belgium, with which her navy could at all times threaten England with blockade and so make sure "the freedom of the seas." Germany wanted coaling rights everywhere; this demand looks absurd because Germany has always possessed such rights in peace times. She might give France a piece of Lorraine and a part of Belgium---perhaps Brussels---in return for the payment of an indemnity. Wangenheim requested that, I should place Germany's case before the American Government. My letter to Washington is dated January 11, 1915. It went fully into the internal situation which then prevailed and gave the reasons why Germany and Turkey desired peace. A particularly interesting part of this incident was that Germany was apparently ignoring Austria. Pallavicini, the Austrian Ambassador, knew nothing of the pending negotiations until I myself informed him of them. In thus ignoring his ally, the German Ambassador meant no personal disrespect; he was merely treating him precisely as his Foreign Office was treating Vienna---not as an equal, but practically as a retainer. 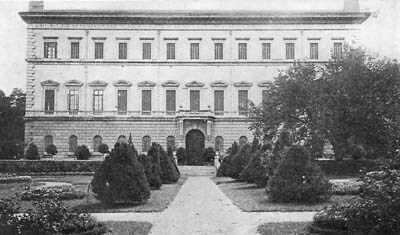 The world is familiar enough with Germany's military and diplomatic absorption of Austria-Hungary, but that Wangenheim should have made so important a move as to attempt peace negotiations and have left it to Pallavicini to learn about it through a third party shows that, as far back as January, 1915, the Austro-Hungarian Empire had ceased to be an independent nation. "We shall have peace within three months, Excellency!" This little scene took place, and this happy forecast was made, in March, 1915!